Ruhiyyeh Narimaan released in Shiraz: a reason for hope? Ruhiyyeh Narimaan (روحیه نریمان) was provisionally released from prison in Shiraz on March 9. Her sentence has been put in abeyance pending a sitting of the Provincial Review Court. Mrs. Narimaan and her husband Farzaad Delaaraam (فرزاد دلارام) were originally sentenced to five years in prison by the notorious Judge Sadati ( قاضی ساداتی), but the Review Court reduced this to two years and six months for Ruhiyyeh Nariman and one year for Faarzaad Delaaraam. They were arrested in Shiraz on October 8, 2018, to begin serving their sentences, so she has served only five months of her 30-month sentence. Her husband was released in early February, benefiting from an amnesty for some prisoners of conscience marking the fortieth anniversary of the 1979 Revolution. Mr. Puya Tabayaniyan (پویا تبیانیان), a Bahai who began as sentence of seven years in the Central Prison of Semnan on December 22, 2012, has been released unexpectedly after six years and two months. While prisoners in Iran generally are granted early release for good behaviour, this provision does not usually apply to Bahais. He was granted prison furlough for a few days, and when he returned to prison on March 2, he was told that he was free to go. Mr. Tabayaniyan was first arrested on March 8, 2009 and held in solitary confinement for two months, during which he was interrogated by Judge Dowlat-Khah (قاضی دولت خواه). He was sentenced to two years in prison, and was granted a conditional release on April 29, 2010, with a six-month suspended sentence. Then he was one of four Bahais who were arrested in Semnan on March 12, 2011. He was released on bail on April 3, and re-arrested on June 11. This was apparently for further interrogation, as reports from that time indicate that he released ten days later, on June 21, 2011. He was charged with undermining national security and propaganda against the regime, and sentenced to six and a half years in prison by Judge `Eyn al-Kamaal (قاضی عین الکمال). The six month suspended sentence was added to this. In January, 2016, another prisoner released from the Central Prison of Semnan reported that Mr. Tabayaniyan was in solitary confinement in the prison. The reason and duration of this are not reported. Bahai News (Persian), January 9, 2017. Ahmad Fana’ian ( احمد فناییان), an elderly Bahai farmer living in Semnan Province, was murdered on the night of January 7, and his body was burnt to such an extent that DNA tests were required to identify the victim. It is not clear whether there was a religious motive for the murder. Bahai News, January 18, 2016. Reports indicate that Mr. Puya Tabayaniyan (پویا تبیانیان), a Bahai who began as sentence of six and a half years in the Central Prison of Semnan on December 22, 2012, is being held in solitary confinement. The information apparently came to light after the release of Afshin Eqani (افشین ایقانی), another Bahai prisoner in Semnan, on December 25, 2015. Mr. Tabayaniyan was arrested on March 8, 2009 and held in solitary confinement for two months, during which he was interrogated by Judge Dowlat-Khah (قاضی دولت خواه). He was sentenced to two years in prison (this report says, 2 years and 6 months), and was granted a conditional release on April 29, 2010. He was one of four Bahais who were arrested in Semnan on March 12, 2011. He released on bail on April 3, and re-arrested on June 11. This was apparently for further interrogation, as reports from that time indicate that he released ten days later, on June 21, 2011. He was charged with undermining national security and propaganda against the regime, and sentenced to six and a half years in prison by Judge `Eyn al-Kamaal (قاضی عین الکمال). The report does not indicate why he would be held in solitary confinement, or when this began. On November 1, judicial officers went to the cut-glass manufacturing shop belonging to Afrasiab Khanjani (افراسیاب خانجانی), a Bahai from Semnan, and seized his entire stock. In 2012, a lens-making workshop belonging to Mr. Khanjani was closed, and his trading licence was revoked. Susan Tabyaniyan (سوسن تبیانیان), a Bahai from Semnan who has been serving a one-year sentence in Isfahan prison, was released from prison on November 2. She was charged with propaganda against the regime, opposition to the regime and propaganda in support of opposition groups, in the form of giving interviews to foreign media about the economic situation of the Bahais in Iran, and began her sentence on December 24, 2014. This was her second prison sentence: in May 2010 she was sentenced to 18 months in prison on charges of propaganda against the regime and membership of a Bahai organisation. 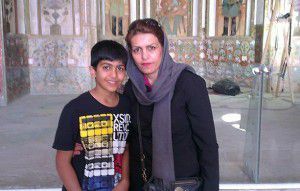 After serving almost 14 months in Evin prison, she was one of the prisoners granted clemency to mark Eid al-Fitr, on August 27, 2011. She was arrested again on May 31, 2014, released on bail on July 15, and sentenced to one year in prison on September 11. She has two children. Fifty hectares of land and the livestock on it, belonging to Zia’ullah Muta`arifi (ضیاء الله متعارفی), a 65-year-old Bahai from Semnan, was confiscated on October 15. The decision was made at a court hearing in Semnan, attended by officials from the Ministry of Agriculture in Semnan, the Public Prosecutor, and representatives of the security forces. Mr. Muta`arifi has been working this land since 1982, and purchased it in 1999, paying in installments. He was told his title would be confirmed once he paid a fee to confirm the area and improvements, and this last cheque had been cleared. But afterwards, the sellers denied having sold the land. A lower court decided against Mr. Muta`arifi, and the case was referred to the Provincial court of review. According to Mr. Muta`arifi, the review court judge initially overturned the lower court ruling, but later said that this was a mistake and referred the case to another court, which ruled that the land should be confiscated. Mr. Muta`arifi has been allowed to retain 3552 square meters, which he says is not suitable for use due to its location. The confiscated land had 17,000 mature trees and vines: pistachio nuts, olives, pine trees, grapes, pomegranates and others. Mr. Muta`arifi was not permitted to remove his belongings and implements from the land. Mr. Muta`arifi had also written to an advisor to the President, who passed his letter to the Ministry of Agriculture, who said that this was a political case, and they could not interfere. Mr. Muta`arifi introduced the first pressurized irrigation system in the province, and planted the first olive trees. He has received several awards from the Ministry of Agriculture and the Department of Agricultural Development, and a recognition from the international Food and Agriculture Organisation. According to another report, by the Campaign against the harassment of Bahais, the farm employed about seven staff, some of whom lived on the land with their families. Mr. Muta`arifi said that his only concern was to serve the people of Iran, and his only fear was that the trees would be left to dry out and die. In January, 2010, Mr. Muta`arifi’s license to run an animal husbandry unit was revoked by the Department of Agricultural Development, who levelled accusations which Mr. Muta`arifi denied. Iran Press Watch, August 26, 2015. On Monday 24 August, officials shut off the water supply for residents of the small town of Dazgareh in Semnan province. The water comes from a well dug with a legal permit 25 years ago, and given to the town by the Khanjani Family. The family are Bahais. The police, Revolutionary Guards Corps, and Intelligence and Security agents of the water authority and other officials, including Mr. Ehsani, head of the Intelligence service, were in attendance. They had a special expedited order to destroy the well, and used heavy construction machinery. Work continued to 2:00 am in the morning. Several members of the Khanjani family have been imprisoned for their Bahai beliefs, their property has been confiscated and factories and businesses belonging to family members have been closed down. Intelligence and Security agents had previously destroyed a dirt dam built with a legal permit for the purpose of generating electricity, cutting electric power to the area. One piece of land that was given to one of the members of this family thirty years ago was unjustly seized and given to the Revolutionary Guards. Officials have also destroyed their home, and the executive committee has issued an order to confiscate their lands and farms. The Municipal Security Council of the province, in the presence of the Governor Vakili, appointed by the Rouhani administration of “Prudence and Hope,” have declared the entire area in which the family’s ancestors have lived for generations a military zone. Revolutionary Guard monitors criss-cross the area, and only particular individuals may visit the family property and stay a few hours, or at most a few days. The pressures started during the Ahmadinejad government and continue to the present. Local authorities in Sari shut down three businesses run by three Bahais, on May 24, because they had been closed on Bahai holy days. The businesses are a shop selling colours, run by Ziullah Khushbin (ضیاالله خوشبین), the wood turning workshop of Kemal Akbari (کمال اکبری), and a toiletries shop run by Ehsanullah Sana’i (احسان الله سنایی). Recently 12 Bahais in the city of Rafsanjan had their businesses closed by local authorities, because they were shut on the three Bahai holy days of Ridvan, which this year fell on April 21, April 29 and May 2. Regulations allow local authorities to shut down any business that is closed, unannounced, for more than 15 days in a year. However there are less than 15 Holy Days in the Bahai calendar, and in any case the Bahai owners normally inform local authorities of upcoming Holy Days. In Semnan, the vacation home of Jamaledin Khanjani (جمال الدین خانجانی), one of the seven imprisoned ‘Yaran’ (national facilitators for the Bahai community in Iran), has been demolished by security agents. According to a member of the family, one day they were told that they had 48 hours to vacate their house and the next day, even though they had obtained an order to delay the demolition from the Supreme Court, their house, which was situated in the middle of an agricultural field, was bulldozed. Jamaledin Khanjani has been in prison since 2009 without leave. He has been sentenced to 20 years of prison. Foad Khanjani, his grandson and Navid Khanjani, another member of the Khanjani family are also in prison. I Free my Iran, April 5, 2015. Behfar Khanjani (بهفر خانجانی), a Bahai prisoner of conscience serving a four-year sentence in Seman’s central prison, was freed from prison on April 4, at the end of his sentence. He was arrested on January 6, 2010, and held for 25 days in solitary confinement. He was held in prison for another month and released on bail on March 1, 2010. He began serving his sentence, for membership of illegal Bahai groups and attending Bahai prayer meetings and the 19th-day ‘Feast,’ on June 22, 2011. His sentence was later extended by one year for “propaganda against the regime,” but from today’s report it appears that this sentence has been served concurrently, or has not yet been implemented. Mr. Khanjani suffers from an incurable medical condition, and his condition is fragile. He was given a brief medical leave in January 2012. Maf News, February 24, 2015. Behfar Khanjani (بهفر خانجانی), a Bahai prisoner of conscience serving a five-year sentence in Seman’s central prison, has been denied the right to receive family visits as a punishment for writing a letter to Dr. Jahangiri, the head of Iran’s Prison Association. Mr. Khanjani was initially given a four-year prison sentence for membership of illegal Bahai groups and attending Bahai prayer meetings and the 19th-day ‘Feast.’ His sentence was later extended by one year for “propaganda against the regime.” Mr. Khanjani suffers from an incurable medical condition which is at an advanced stage, and his condition is fragile. He was given a brief medical leave in January 2012. Although the Warden of the Central Prison in Semnan and the supervising judge approved an end-of-sentence furlough for Mr. Khanjani, Mr. Asyabi, the City Attorney of Semnan, and Mr. Arab, who is in charge of all the prisons in Semnan, said that he was barred from receiving a furlough. Mr. Khanjani then wrote to Dr. Jahangiri, criticizing the decision and saying that it breached his legal and human rights. Officers at the Semnan central prison then criticized Mr. Khanjani and told him that he would be denied family visits as a punishment. Fariba Kamalabadi (facebook page), December 25. Susan Tabyaniyan (سوسن تبیانیان), a Bahai from Semnan, has been summoned to begin serving a one-year sentence. This is her second prison sentence: in May 2010 she was sentenced to 18 months in prison on charges of propaganda against the regime and membership of a Bahai organisation. After serving almost 14 months in Evin prison, she was one of the prisoners granted clemency to mark Eid al-Fitr, on August 27, 2011. She was arrested again on May 31, 2014, released on bail on July 15, and sentenced to one year in prison on September 11. The review court has confirmed the sentence of Susan Tabyaniyan (سوسن تبیانیان), a Bahai from Semnan who was arrested on May 31, 2014. She was sentenced to one year in prison and the confiscation of all possessions connected to the Bahai Faith by Judge Amiri, sitting in Bench 1 of the Revolutionary Court in Semnan. Susan Tabyaniyan (سوسن تبیانیان), a Bahai from Semnan who was arrested on May 31, 2014, has been sentenced to one year in prison. Her trial took place on August 7. After her arrest she was held for 45 days before being released on bail. Mrs. Tabyaniyan had a shop in Semnan until her arrest in April, 2009. In May 2010 she was sentenced to 18 months in prison on charges of propaganda against the regime and membership of a Bahai organisation. 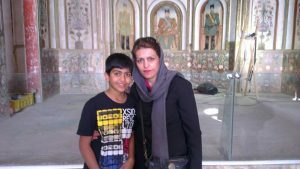 After serving almost 14 months in Evin prison (some of them in the methadone user’s wing), she was one of the prisoners granted clemency to mark Eid al-Fitr, on August 27, 2011. She was rearrested on May 31, 2014, and released on bail 6 weeks later. PCED (facebook), September 11, 2014. Mrs. Tabyaniyan, who has two small children, had a shop in Semnan until her arrest in April, 2009. In May 2010 she was sentenced to 18 months in prison on charges of propaganda against the regime and membership of a Bahai organisation. After serving almost 14 months in Evin prison, she was one of the prisoners granted clemency to mark Eid al-Fitr, on August 27 2011. Noushadhar Khanjani ( نوش‌آذر خانجانی), a Bahai from Semnan who was visiting family in Semnan, was arrested by security forces this morning. He has been interviewed by the Ministry of Intelligence several times in the past months, on various pretexts, and is presently free on bail and having provided a surety. His father, Afrasiab Khanjani (افراسیاب خانجانی ) has been subject to pressure from the security forces for some time, and has had much of his property confiscated, including a factory for making spectacles. The family have been told that Noushadhar will be transferred to Tehran tomorrow. `Adel Fana’ayan (عادل فنائیان), a Bahai from Semnan, has been freed on parole. He was serving a six-year sentence in Semnan’s central prison, which he began on June 11, 2012, meaning that he served just one third of his sentence. He was charged with propaganda against the regime and undermining state security. This was his sixth period of imprisonment. The license of his business in Semnan has also been revoked. Susan Tebyaniyan (سوسن تبیانیان), a Bahai from Semnan, was arrested 17 days ago in her home, and has been held since then, without clarification of her status, in Semnan’s central prison. She is being kept separate from the other female prisoners. An informed source told HRANA that there is a policy of keeping Bahai women separate from other prisoners, and Susan Tebyaniyan is the only Bahai woman held in that prison, she is being kept in isolation. She was detained on a warrant allowing 7 days detention, but after 17 days she has neither been freed nor taken to court. Mrs. Tebyaniyan, who has two small children, had a shop in Semnan until her arrest in April, 2009. In May 2010 she was sentenced to 18 months in prison on charges of propaganda against the regime and membership of a Bahai organisation. After serving almost 14 months in prison, she was one of the prisoners granted clemency to mark Eid al-Fitr, on August 27 2011. Susan Tebyaniyan (سوسن تبیانیان), a Bahai from Semnan, was arrested in her home on the evening of May 31st. Agents from the Ministry of Intelligence searched her home, seized a computer and religious books and images, and arrested her. Mrs. Tebyaniyan, who has two small children, had a shop in Semnan until her arrest in April, 2009. In May 2010 she was sentenced to 18 months in prison on charges of propaganda against the regime and membership of a Bahai organisation. She began her sentence in Evin prison on July 1st, 2010. After serving almost 14 months in prison, she was one of the prisoners granted clemency to mark Eid al-Fitr, on August 27 2011. In the past two months, five young Bahais in Semnan have been arrested and sent to military service, on the orders of a judge (or in a previous report, an assistant prosecutor) known as Mr. Zaman. HRANA states that the military call-up law had been disused for some years, and that its application to the Bahais has been initiated by the Ministry of Intelligence. Erfan Ehsani (عرفان احسانی): at the time of his arrest, he was made to promise that he would serve in the military after completing his time in prison. he was sentenced to one year in prison, which he began serving on October 30, 2012. After his release on parole, he was drafted into the army although his wife and their baby were in prison. Soroush Firuzayan (سروش فیروزیان): after his home was raided, he was arrested and sent on military service. Ardeshir Fana’ayan (اردشیر فناییان) was serving a 9-month sentence in Semnan prison. On completing his sentence, he was sent to do military service. Omid Pirasteh (امید پیراسته): presently doing his military service. Na’im Hedayati (نعیم هدایتی): presently doing his military service. Another Bahai youth, Avarakhsh Hedayati (اورخش هدایتی), was reported among the Bahai youths who were arrested in November, 2013, but has been exempted from military service. On January 25, Hadjabr Firuzeyan (هژبر فیروزیان) reported to Semnan prison to begin serving a 40-day sentence. He is the father of Golrokh and Shidrokh Firuzeyan (شیدرخ و گلرخ فیروزیان), who began serving 6-month sentences in Semnan prison on January 8, 2014. His name has also been reported as Hadjir Firuzeyan (هژیر فیروزیان) and on this blog as Hadjbar Firuzeyan. He complained of the physical abuse of Golrokh by a Ministry of Intelligence interrogator. During one of her interrogations, the interrogators were harsh. One interrogator stood behind her and pulled her against the back of the chair, leaving her with severe back pains and a bleeding nose. Mr. Firuzeyan informed the officer handling the case, the Prosecutor and the Chief Justice. When there was no response from them, he wrote to the President of Iran, detailing the treatment of his daughter, and also tried to present this letter to the President when he was visiting Semnan. [From the dates, it would appear this refers to President Rouhani, who promised that human rights would be respected in Iran but has not been able to improve the situation at all.] Mr. Firuzeyan was arrested by the Ministry of Intelligence and held in solitary confinement for some time. He was later fined 12 million rials (350 euros, $US 480), which was confirmed on appeal, for defaming the head of the Semnan office of the Ministry of Intelligence, Mohammad Reza Hashemian (محمد رضا هاشمیان). He has chosen to serve 40 days in prison rather than pay the fine. to serve his sentence in Semnan prison on February 17, 2013. He was charged with propaganda against the regime and membership of the Bahai community. His optician’s shop was raided by security forces on November 29, 2012. The authorities not only confiscated his entire stock, valued at 2 billion rials (125,000 euros, 162,000 US dollars), he was fined 3.6 billion rials (225,000 euro, 293,000 US dollars) after a secret trial. Two years ago, Nilisa Yahyahvi ( نیلیسا یحیوی ), a graduate in Persian language and culture, was barred from university studies with the excuse “file incomplete” — a euphemism used to disguise religious discrimination in Iran’s education system. In this academic year she again applied, and was admitted to a Master’s course at Semnan University. She attended classes until one week before her expulsion, when university officials asked for her BA diploma and a few day later, contacted her by telephone to ask some questions about her religious beliefs. She was then told that she was barred from further study at the University. Zohreh Nik-A’in ( زهره نیک آئین ) who has been in prison in Semnan along with her baby, was released on parole on December 4. A week later, Anisa Fana’ayan ( انیسا فناییان ) and Taraneh Torabi ( ترانه ترابی ), also imprisoned in Semnan (the latter accompanied by her baby), were released on parole. Zohreh Nik-A’in was sentenced to 23 months in prison by the revolutionary court of Semnan on June 22, 2012. She began her sentence on September 24, 2012. Anisa Fana’ayan was originally sentenced to 4 years and 4 months, reduced to 22 months on October 14, 2012. She began her sentence on January 12, 2013. Taraneh Torabi was arrested on February 20, 2011, and sentenced to 5 years and 10 months in prison on charges of “setting up and running an illegal group” on February 23, 2012. This was reduced to 20 months on July 1, 2012. She began her sentence, accompanied by Barman Ehsani ( بارمان احسانی ), aged six months, on September 24, 2012. On December 26, Barman was taken to hospital suffering from a severe lung infection. Late in 2012, the women’s block at Semnan prison was reported to contain 70 prisoners and a number of babies, crowded into 50 square meters, which did not allow enough beds for all prisoners. Security agents have raided homes and arrested young Bahais in Semnan, under the pretext of enforcing the military service law. They carried a letter from someone called Zaman, an assistant prosecutor. They raided the homes of Bahais who sons are eligible for military service. After a thorough search and turning the homes upside down, they seized religious books, computers and personal items, arrested the young men and handed them over to the police. Those arrested were held for one day and released after signing a form that they would present themselves whenever they are summoned. At the time of writing, those arrested and released are known to include Ardeshir Fana’ayan, Awrakhsh and Na’im Hedayati and Saroush Firuzayan ( اردشیر فناییان، اورخش هدایتی، نعیم هدایتی و سروش فیروزیان ). One of the Bahais went to the Police Office to ask the reason for this procedure and was told that the military call-up law had been disused for some years, and that its application to the Bahais had been initiated by other agencies.